Our amazing leadership team at Schulson Collective restaurant, Monkitail has grown above and beyond my expectations over the last year and a half. The work my best-of-the-best team has done to make this an award-winning modern Japanese restaurant is something I’ll always be grateful for. Congratulations to Tobias Moser, Nina Tinari, Chef Sung Kim, Larry Duran and those not mentioned for all that you’ve accomplished so far. Schulson Collective restaurant, Giuseppe & Sons, offers patrons both a delicious grab-and-go lunch and a formal dining room where friends and family can enjoy great food, a little wine and a lot of laughter. Menu items at the Luncheonette include heart-warming soups, nutritious salads, satisfying sandwiches and tasty party platters featuring all of the above. If you’re ever in the Philadelphia area, feel free to stop by and enjoy on-the-go! Seeing people enjoy your food is one of the greatest gifts a chef can receive. Watching photos of our food pop up on social media is a joy. We especially love hearing all about our patrons’ experiences at Schulson Collective restaurants. This incredible photo of our Crispy Tofu served with mizuno pesto and a miso caramel from Monkitail was taken by a happy customer. Thank you, Mr. And Mrs. EATS for capturing the essence of our food! My nana was my greatest inspiration and the reason I launched Schulson Collective and my career as a chef. Cooking was her greatest passion and it quickly became mine. We spent countless hours in the kitchen together and I will always cherish those days. *A little more for boiling water. Warmed sake broth, for serving. Click here to watch this how-to video and learn exactly how to make Edamame Dumplingsfrom Michael Schulson. This past blog also offers a few helpful tips! There are few things better than fresh, homemade pasta. All of the pasta we serve at Schulson Collective restaurant, Giuseppe & Sons, is made in house, daily. Our gnocchi making process is especially labor intensive, but we wouldn’t have it any other way. 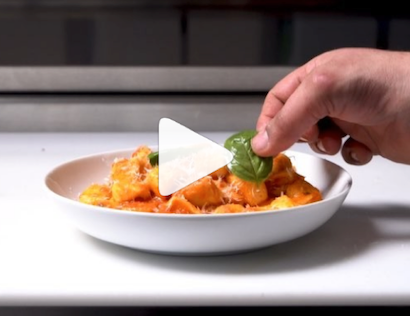 From start to finish, here is a look at how we create one of our most popular dishes, Gnocchi Basil Pomodoro with ricotta, San Marzano tomatoes and basil. It’s always great to be in the kitchen with my incredible team. 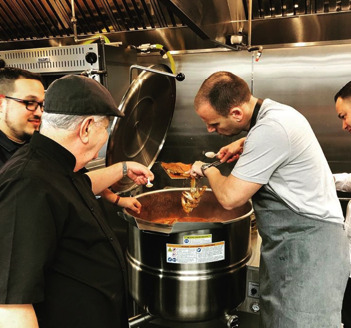 Wesley Fields, Vince Termini Sr., Vincent Termini Jr. and Leo Forneas joined forces with me at Schulson Collective restaurant, Giuseppe & Sons, to create this delicious blue crab gravy with parsley and San Marzano tomatoes for our Crabs and Spaghetti dish. I am honored to work with some of the best in the business. The best cure for long winter days is a great happy hour. Schulson Collective restaurant, Double Knot in Philadelphia, offers a great daily happy hour featuring hand rolls, dumpling varieties, tasty sides and more for great prices. It’s the perfect excuse to skip your ordinary dinner plans and unwind after a long day at work. Sampan, Schulson Collective’s very first Philadelphia venture, has officially been open for nine years! Located in the heart of Center City, Sampan serves an oasis of contemporary Asian small plates and a curated selection of wine, beer, sake and cocktails. After eight more restaurants, the opening of Schulson Catering and many other milestones, the wild ride has been one I wouldn’t change for the world. A big thank you to my family, friends and fellow chefs for all of your constant support. Think Magazine recently featured Monkitail, a Schulson Collective restaurant in South Florida located inside of the gorgeous Diplomat Beach Resort. This modern restaurant specializes in fresh Japanese fare with a twist. In the article, Think Magazine calls Monkitail a not-so-hidden gem that’s definitely worth a visit. A big thank you to my amazing team at Monkitail for making this unique eatery such a success! Meals cooked at home don’t always have to be made from scratch. Life gets busy and sometimes our kids prefer something simple. My boys have always remained loyal to Kraft Mac and Cheese and there’s nothing wrong with that. Although, Rooster's Comb Mac & Cheese from Schulson Collective restaurant, Harp & Crown, in Philadelphia is one of my favorites! DK Sushi offers patrons a fine casual experience in Philadelphia. Here you have the choice of taking your sushi to-go or sitting down and enjoying traditional omakase, meaning “I’ll leave it up to you”. Opposites often attract in the culinary world. The Tuna Rice Cracker served at Double Knot is the perfect combination of crunchy and smooth textures. Featuring spicy tuna, soy, chili, nori and avocado puree, this small plate always satisfies. A dry aging room is one of my favorite restaurant tools. The process is ideal for tenderizing and removing moisture from meat. As we prepare to open Alpen Rose, a steak boutique in Philadelphia, we chose this technique to serve the highest quality meats. Pro Tip: Use a charcoal grill when cooking dry aged meat at home; it will help burn off the fat and boost flavor.